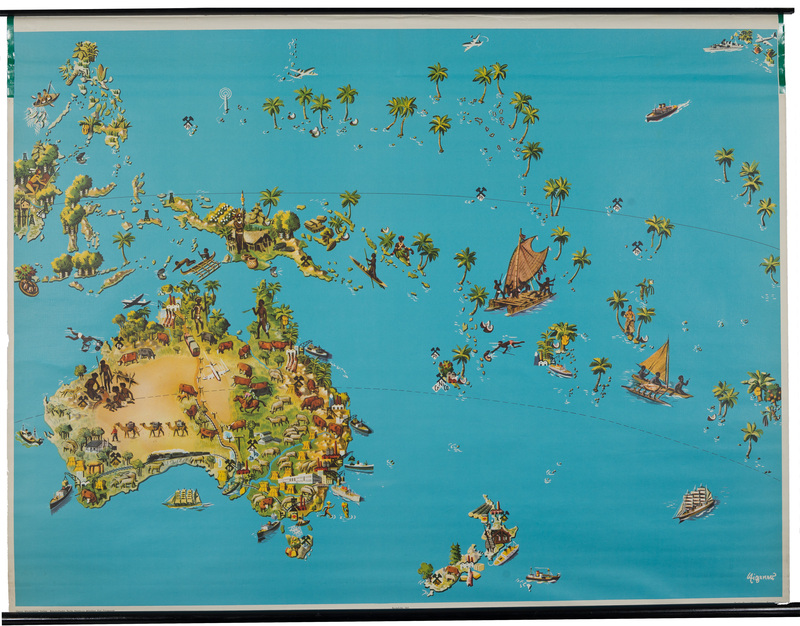 This splendid, fun, large-scale pictorial wall map by Georg Westermann depicts Australia and the South Pacific, emphasizing economics, industry and transportation. The salient features of each category are depicted pictorially rather than by headings or written descriptions. Thus, coastal areas of Australia are filled with images which evoke patterns of these categories throughout the continent and in nearby islands. The agricultural enterprises of Australia are well described, with livestock and harvested crops in great array. Diving for pearls off the coast is pictured. Mining for minerals of a wide variety is represented by symbols for elements of the periodic table, denoting natural resources which are found in various regions of the continent and islands off the coast. A train of camels crosses the interior desert land of Australia, and nearby a modern version makes its way northward. Condition: This large colorful map is in A condition. The dowels on which it is hung are solid and show little sign of wear, and the self-tie and heavy duty cord for hanging are in almost-new condition.